Here we are in the height and the heat of summer. Summer is the season for swimming pools, outdoor concerts, picnics, hikes, beach trips, barbeques, and gardening. All the things we love to do with sun shining brightly on us. The sun is our primary source for vitamin D, helping us strengthen our bones. The sun is also our primary source for skin cancers and cataracts. Like everything enjoyable, the lesson here is everything in moderation. July is National Ultraviolet Safety Month, which means we want to do what is right for both our skin and our eyes. UV light is divided into three subtypes or wavelengths. AVA is the longest wavelength ultraviolet light and is not absorbed by the ozone layer. UVB is a medium wavelength ultraviolet light and is mostly absorbed by the ozone layer. UVC is short-wave ultraviolet light and is completely absorbed by our atmosphere and the ozone layer. Since air pollution has helped weaken the ozone layer surrounding the earth, we are more susceptible to the dangers of UV radiation. UVA rays can penetrate deep into our skin while UVB rays only penetrate the epidermis or exterior layer of our skin. UVA accounts for 95% of the UV radiation that reaches earth. It is the cause of various sun damage and what causes wrinkles. UVB rays are responsible for producing natural vitamin D. UVB is also what causes most sunburns and has been linked strongly to skin cancers. While most of us want to enjoy the sun, with some even worshiping it, we want to be aware that we can do so safely. Wear a broad-spectrum sunscreen when outside for any length of time with an SPF (Sun Protection Factor) of 15 or more. A broad spectrum sunscreen will help shield against both UVA and UVB rays. 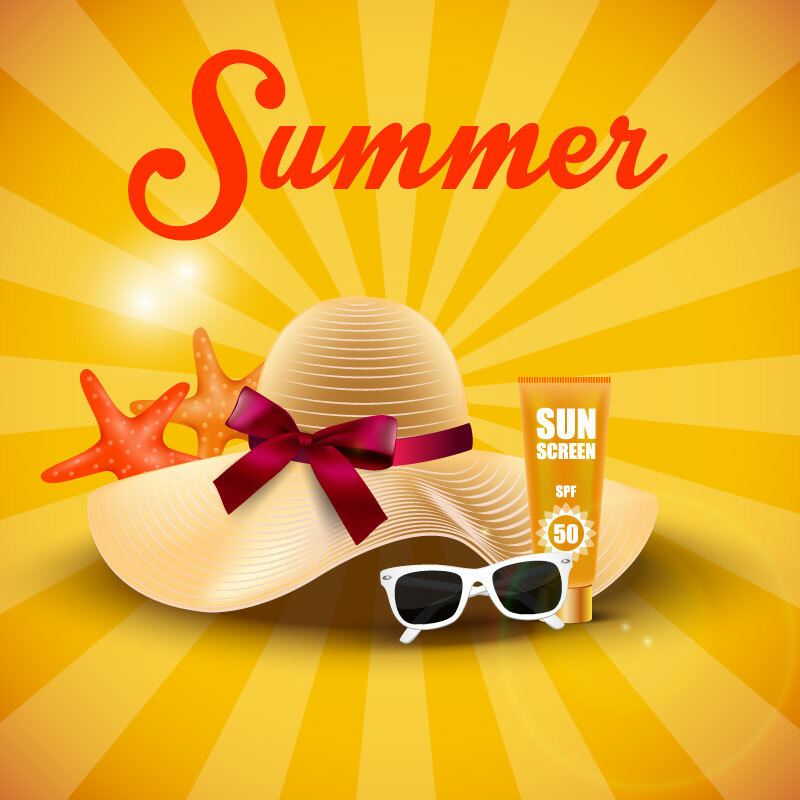 If you are outside for more than 2 hours, be sure to reapply sunscreen. One way to protect against too much sun is to cover our skin when outside. Linens and cotton are the most comfortable fabrics to wear in the heat of summer. Staying outside but out of the sun, especially during the peak hours of 10 AM to 2 PM can help limit sun damage. Our eyes are as susceptible to damage as our skin. Like most anything we can purchase, we get what we pay for. A cheap pair of sunglasses may darken what you see, but may not adequately protect your eyes from both UVA and UVB rays. A dark pair of sunglasses that doesn’t protect from UVA and UVB rays can actually be more dangerous for your eyes that no sunglasses. Without sunglasses, your iris closes to a small aperture in bright sunlight. With dark lenses, it opens up. Without full protection from UVA and UVB, more ultraviolet light can enter your eyes with cheap lenses. We have a wonderful selection of quality sunglasses to choose from this summer. Be safe, have fun, look great, and protect your eyes with a wonderful pair of sunglasses from American Vision At The Court.